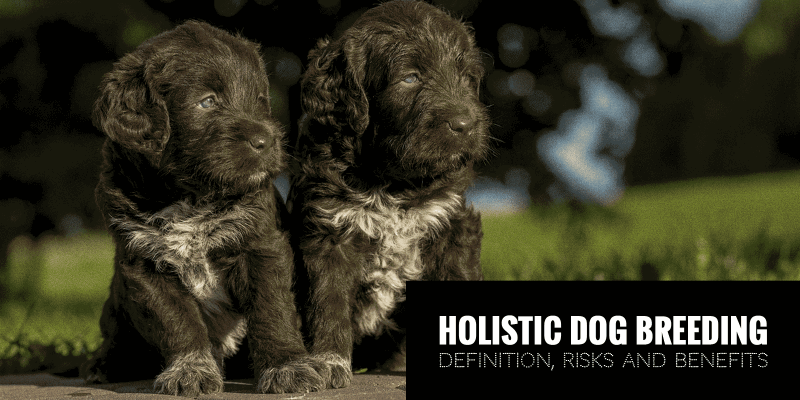 What Are Holistic Dog Breeders? 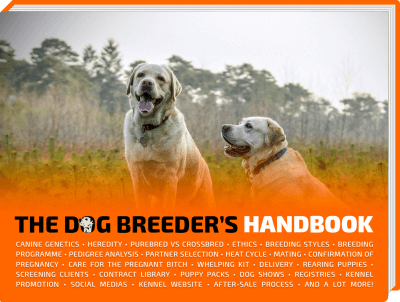 Where to Find Natural-Rearing Dog Breeders? Holistic dog breeders and natural rearing in dog breeding follow a philosophy in which the dogs are conforming to a strict natural way of living. Naturally-reared puppies and holistic breeders stay away from vaccines, commercial dog foods and unnatural supplements. A naturally healthy dog is a wonder despite a higher cost; and there is some pride to being a holistic dog breeder. However, there are disadvantages and some lethal ones at being rearing puppies naturally. Vaccines, dewormers, and other supplements, have been perfected over decades and helped increasing human and canine lifespans for a reason: they tend to be effective. Holistic dog breeders feed their dogs a natural diet and avoid giving their dogs chemicals. They typically feed their dogs a raw diet. 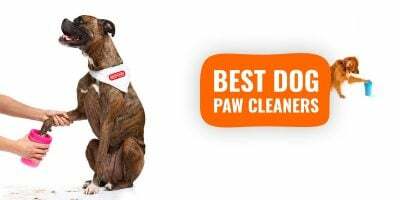 Often they do not vaccinate their dogs or treat their dog with the typical medicines for deworming and flea and tick prevention. They claim that the regimen makes their dogs healthier and longer-lived. Holistic dog breeders have been around for almost a century. Many holistic dog breeders will cite the work of holistic veterinarian, Juliette de Bairacli Levy (1912-2009), as a guiding light in their philosophy. Levy studied and wrote extensively about the benefits of removing 20th-century chemicals from the canine’s body and feeding only what nature would provide. Her books are frequently referenced in publications advocating and advising on holistic veterinary medicine. This group of dog breeders does vary in its adherence to the natural regimen. Most do not use commercially-prepared dog food. There are, though, commercially-prepared “holistic” or “organic” dog foods on the market. These products are labeled free of added colors, preservatives, and are typically grain-free. It is common for holistic dog breeders to feed their dogs raw meats like chicken necks, beef bones, etc. Those that feed a raw diet claim that their dogs have better coats and fewer autoimmune and allergy problems. Dogs like humans can have allergies to grains like wheat which are frequently added to dry dog food. Some breeds like Dachshunds, Labrador retrievers, and Cocker Spaniels are particularly prone to food allergies. These breeds can benefit from a more careful and hypoallergenic diet. Many practitioners of the holistic dog breeding philosophy employ homeopathic treatments for illnesses and preventive medicine. In homeopathy, minute amounts of a natural substance which would produce symptoms of a disease are administered. Dogs may be given nosodes or small amounts of diseased tissue. The idea is that the dog will then develop a natural immunity to a disease. A substantial market has developed for both dog and human homeopathic medicine. Although the ideas are akin to the successful techniques used in the development of certain vaccinations and in the treatment of allergies, the research has not backed most of the claims of effectiveness. The bulk of these medicines fall into the realm of quackery — at least according to most veterinary researchers. This group of holistic dog breeders, also, engage veterinarians that practice veterinary medicine using non-traditional treatments. Such practices commonly employ acupuncture, aromatherapy, essential oils and herbal treatments. Acupuncture is the Chinese method of treating various conditions by inserting needles into various parts of the body. It is based on the idea of various points of energy flow in the body. The use in dogs is not well studied. In humans, acupuncture has been shown to have some effectiveness in pain management. Aromatherapy uses the smell of various flowers and roots. Essential oils use various flowers, roots, and herb and boil them down into a concentrated tincture. These usually pungent scented plants are then mixed with an oil such as olive or almond and applied to a body part or used in aromatherapy. They are said to be helpful in combating anything from stress to skin diseases. Herbal treatments abound for all sorts of ailments. One of the most common are the herbal remedies to treat worm infestations. Holistic breeders do not use commercial dewormers but would give dogs doses of garlic or pumpkin seeds (among other things — and especially effective during a full moon). Supplements for dogs, of all kinds, are not overseen by the FDA like human and dog foods are. Oftentimes, natural rearers will use various supplements much like people do. Glucosamine is a popular supplement for humans suffering from arthritic conditions. Many holistic rearers will give this supplement to an aging dog that may have some issues with osteoarthritis. Multivitamins, too, are frequently added to a dog’s diet. Minerals like calcium can be given for dams to prevent eclampsia. The problem with these supplements is that the biology of dogs is not the same as humans and most of these supplements, if valid at all, are based on data designed for human, not canine biology. 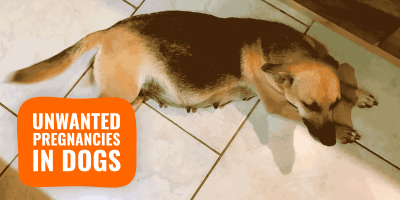 Some of these supplements can actually cause harm to a dog. Many people do not realize that supplements, homeopathic treatments, herbal medicines, and the like are not regulated by the Food and Drug Administration like prescription medicines, treatments and vaccinations. Conventional veterinary medicine like conventional medicine is regulated and the drugs and treatments must be thoroughly tested, safe and effective. There is no federal oversight that a bottle of supplement even contains what it purports to contain much less than it remedies a disease or promotes some aspect of health. Some laws that regulate truth in advertising or deceptive trade practices may fill this vacuum but, in general, these health food concoctions are caveat emptor. 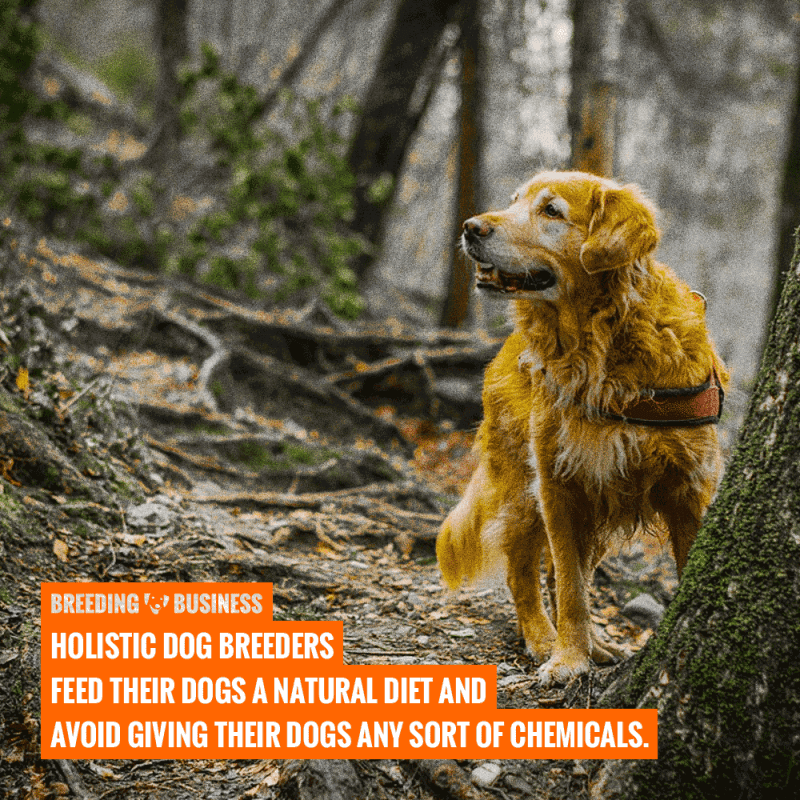 Breeders who want to do holistic rearing should align themselves with veterinarians that are knowledgeable in the nutritional requirements of dogs and be willing to do a lot of research. It is a big mistake for holistic dog rearers and breeders to apply human nutritional standards to canines. They simply do not translate in that way and what may be a healthy food for a person could actually be deadly for a dog. A simple example would be the many interesting human studies that encourage people to add an ounce or two of dark chocolate to their diet. For canines, chocolate and, in particular, dark chocolate is not only unhealthy it is toxic. Similarly, a glass of red wine for dogs is not going to do great things for a canine’s cardiovascular system. These are simplistic examples but it is surprising how many people are willing to force their vegan diets onto their dogs. A growing group of like-minded dog breeders, prefer to rear their puppies as close to nature as possible. Breeders who adhere to natural breeding can be readily located online, including on the website of the Natural Rearing Breeders Association. The problem is finding a natural breeder for a particular desired breed. Local breed clubs and holistic veterinarians may assist in locating a natural dog breeder for the breed of you you specifically want. Some locales may have more holistic breeders than others. It may be necessary to travel some distance in order to purchase a puppy or obtain a stud from a natural dog breeder. NaturalRearing.com has a very useful directory of natural breeders which can be accessed by breed. For example, if a person wanted to find a standard poodle breeder and poodle was selected in the drop-down menu the names of fifteen breeders located in ten different states and Canada can be found. 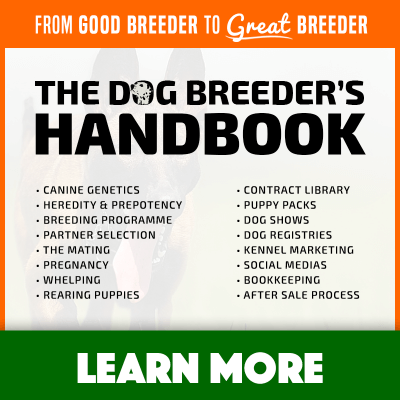 The directory, also, includes useful information as to the kinds of diets the breeders use and the vaccination regimens the breeders adhere to. Breeders can have themselves listed in the directory by just expressing a willingness to learn more about holistic dog rearing or may completely employ holistic methods with diet, homeopathic remedies, and an unwillingness to use any conventional methods in dealing with sickness or preventive veterinary care for their dogs. 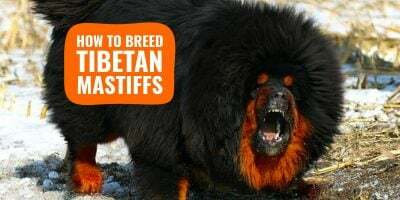 Less common breeds may have only one or two breeders listed. Expect this directory may also offer outdated information. NaturalRearing.com, in addition, has herbal and homeopathic products available for sale. Various supplements and herbal products are for sale that assists breeders with normal pregnancy and delivery of their puppies. The supplement that promotes natural pregnancy and delivery contains three ingredients: Caulophyllum, arnica, and sepia. These plants have been used in human labor and delivery homeopathic medicine. 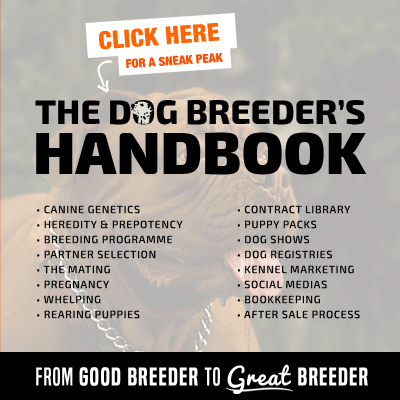 Those people interested in doing business with natural dog breeders need to be aware of the enormous commitment many of these dog breeders have to buck an entrenched veterinary system for the premium health of their dogs and litters. Oftentimes, these breeders will not sell a puppy to anyone who lacks their level of commitment. An element of fanaticism in delineating how a puppy will be raised shouldn’t surprise anyone. Frequently, these breeders will require purchasers sign a puppy sale contract setting out in some detail the diet and veterinary treatment that is expected to be continued after a sale. In general, the most stringent of these contract provisions may not be enforceable. A buyer should consult an attorney in the jurisdiction of the sale to find out whether the provisions of the contract would be enforceable. A contract provision, for example, that would require a purchaser to not vaccinate against rabies when the jurisdiction has a law requiring a dog owner do so would be a provision that would be void because it would be against public policy. One may think that the price of naturally-reared puppies would be less because they are not given expensive commercially-prepared vaccinations, de-wormers, and flea and tick prevention. The opposite is usually the case: naturally-reared puppies tend to be more expensive than regular puppies. The price of a raw diet can, in fact, outstrip the cost of kibble. Homeopathic medicines and treatments can cost substantially more than typical veterinary treatment. The other cost which may be hidden may be in the loss of young puppies because of the lack of appropriate veterinary treatment. Holistic dog breeders will vehemently deny that their philosophy can be detrimental to their dogs but the science does not bear out the effectiveness of particularly homeopathic methods to treat serious diseases like parvovirus or heartworms. Also, holistic breeders scorn the use of preventive interventions like dewormers. They advocate that the preventive schedules of veterinary medicines fail to acknowledge any positive benefits from worm (or helminth) infestation. The natural breeders will wait until a puppy is highly compromised by a worm infestation before initiating a chemical treatment. This approach will, unfortunately, lower a puppy’s ability to survive the ravages of a debilitating parasite infestation. When this puppy does not survive it becomes a cost that other puppies must absorb. Naturally-reared puppies may have breeders that are more committed ideologically to health than the average breeder. These breeders may be very firm in their desire to force buyers of their puppies to agree to their stringent standards of holistic dog rearing. While some of their standards may have some solid science to back them up (like good nutrition for coat health), others can be dangerous and possibly illegal (like foregoing rabies vaccinations). In the middle ground are those puppies that have not have the usual deworming. Most puppies are born with worms. The strongest puppies survive them and the weakest can die from them. A breeder that doesn’t deworm may have some very vital and healthy puppies. The strongest puppies don’t die but the weakest just don’t make it to sale. The puppies that do not survive, though, aren’t a topic of conversation. Some pesticides and industrial chemicals do have known health risks (in humans). Most industrialized countries do identify and ban these substances already. One risk that is frequently mentioned in literature for humans is the use of thimerosal a preservative in vaccinations. Thimerosal contains mercury, a known neurotoxin. Some people implicate it in the development of autism in humans. Holistic breeders will use the presence of thimerosal in dog vaccines as a reason to forego a vaccine. The problem with most holistic breeders is the lack of cost versus benefit analysis. The availability of vaccines has greatly reduced the mortality rate in humans and in dogs. The anti-vaccinators are a fringe group of people that are more invested in an ideology than the truth of what they are doing.